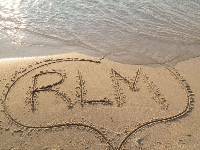 Need a Lake Michigan Vacation that's romantic? Visit an Inn. You'll love the charm and character they offer! To Sue a Lake Michigan vacation means an old inn. They are architectural wonders and ooze romantic charm. For us a romantic Lake Michigan vacation is usually a stay at a cozy little inn. I guess it's that were getting older but the smaller crowds, and slower pace is what we enjoy most. The nice thing is that there are plenty of the charming older ones to choose from. Here Sue is waiting for me to pick her up after an amazing meal at Timothy's located in Gordon Beach Inn. Our favorites are those that were built during the Arts and Crafts period. The Gordon Beach Inn and Lakeside Inn near Union Pier were built in the early 1920's. Recently renovated, a stay in these inns is like stepping back in that period of time. This kind of charm and character really makes for a special, romantic Lake Michigan vacation. The comfy lobby at Lakeside Inn in Lakeside, MI. 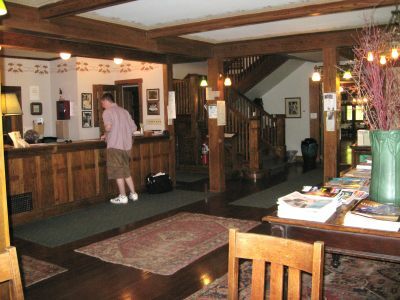 Look for a Lake Michigan inn that has a great lobby or common room with a fireplace, books, and board games. My wife loves to throw on jeans and a sweatshirt, grab a book and a cup of coffee and lounge in the lobby. You always meet some wonderful folks and share some interesting stories. If your looking for a charming place for a wedding, these Inns with all their charm and character are the perfect spot. Many have experienced staff to help you plan and organize. They are popular wedding destinations so you need to contact them early. 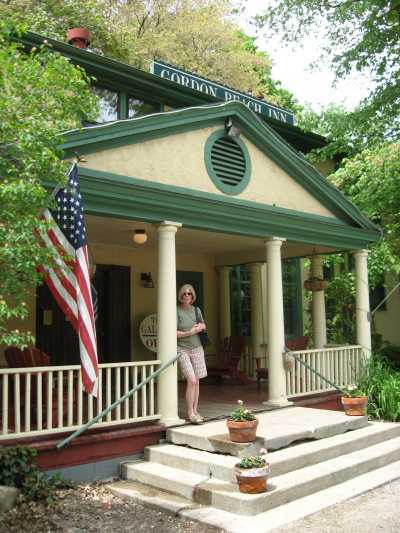 We will keep you updated as we seek out and visit more of these great old Inns along Lake Michigan. You really are in for a special treat if you stay in one of these enchanting destinations of years gone by. This Inn is one of our favorites. The decor is Arts and Crafts circa the 1920s. Nothing to fancy just the ultimate in comfort with a nice beach right accross the road. The perfect romantic Lake Michigan vacation spot. Gordon Beach is the sister inn to Lakeside. Again, it has that great 1920s decor. Smaller than Lakeside but it has a popular restaurant called Timothy's. Even if your not staying there you really need to visit Timothy's for an unforgetable meal. Call in advance for reservations, people travel from a far to dine here. The Belvedere Inn in Saugatuck is described as a "mini Versailles." Many of the inns 14 guest rooms have fireplaces, and all have private baths. They also offer 3 cottages on this charming 2 acre site. The rooms are decorated in a vineyard theme named after grape varities and wine regions. Casually elegant and comfortable. Located accross from Grand Havens famous boardwalk you'll find Harbor House Inn. 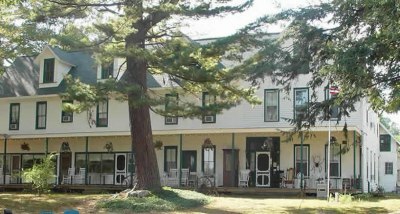 Built in 1987 this 20 room Victorian style inn offers majestic views of Lake Michigan and the Grand River. Close to restaurants, specialty shops and galleries, it is a "romantics" dream Lake Michigan vacation destination. Go to the Harbor House site. Portage Point Inn is located north of Manistee in Onekama, Michigan. Built in 1903 and sitting on a beautiful peninsula between Portage Lake and Lake Michigan. This is a fun place! A scenic setting surrounded by beaches and sandunes. Their marina is capable of handling yachts up to 100 feet. Their restaurant can seat up to 200 so they can handle large parties and wedding receptions. 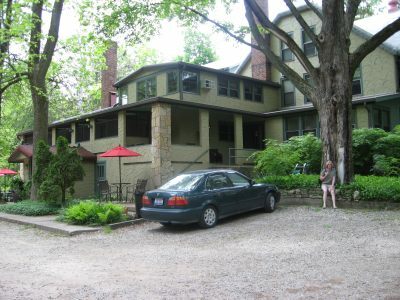 This Leeland Inn is close to everything that spectacular Leelanau County offers. You can visit wineries, Sleeping Bear Dunes, historic Fishtown then return for a romantic meal on one of the decks. They can also help you with your wedding plans. In the middle of year round fun. The historic Bayview Inn in Petoskey offers romance from a by-gone era. Breathless views of Little Traverse Bay add to the charm of this 31 room inn. Take time to check out the Perry Hotel, The Weathervane and Pier Restaurants ...they are all part of the Stafford experience. Go to the enchanting Bayview Inn. Located on Old Mission Peninsula, this 1800s inn has gone through two major renovations. The beautiful suroundings make this a wonderful escape to recharge and rekindle your spirit. A great husband and wife team really make you feel special. How about Yoga on the beach? Old Mission Inn was built in 1869 on the historic Old Mission peninsula. Open year-round so you can enjoy the beauty of each season. They have 4 rooms, 2 suites and a cabin available. Walk to the beach or visit Lighthouse Park only 3 miles away.